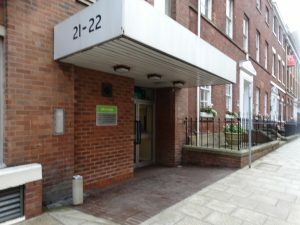 Julie and I are thoroughly enjoying our MA in Public History and Heritage at Derby University – website – but trying to work full time and do an MA has taken its toll on this blog. We had a great day trip to Leeds to visit the Discovery Centre – website. Lucy, one of the curators showed us round, and it was a fascinating (and fun) afternoon. I picked up a flyer for their “Skeletons: our buried bones” exhibition at the City Museum, and managed to go back on Monday 24 October 2017. 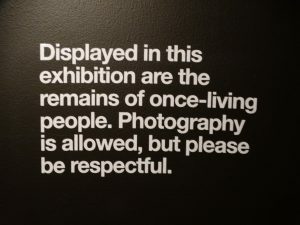 As I have an essay to write on the ethics of displaying human remains, this is a long blog in preparation. The Skeleton exhibition is on the third floor of Leeds City Museum, about 10 minutes walk from the station. A lift is available to the third floor. The web page for the exhibition is here. It is an exhibition of twelve skeletons, seven from London (labelled 1-5) and twelve from Yorkshire (labelled A-G) – a remarkably sensible piece of labelling. The exhibition is in conjunction with the Wellcome Trust and the Museum of London. The latter’s website says the exhibition has been in Glasgow and Bristol before coming to Leeds. 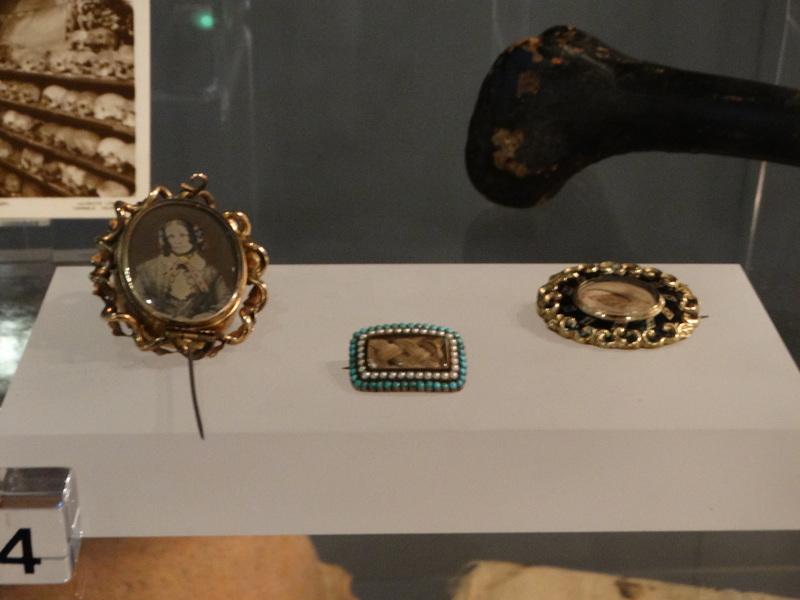 In each case, there is a selection of London skeletons plus others from the local area. The free leaflet details the Yorkshire bodies – there is no suggestion there was a London leaflet produced, and rather amusing we are divided into Regions even in death. Later research has found a book about the London skeletons available from the Wellcome Trust at £7.99 – website – it was not on sale in Leeds. I purchased the last copy of what my dad would have called “this slim volume” when I was in London a few weeks later. The Wellcome’s page about the exhibition – website – includes a 7 minute youtube video. There is no link to this from the Leeds website. The exhibition is in Leeds from 22 September 2017 to 7 January 2018. The Museum of London has their human remains policy available here. The Wellcome Collection’s policy is here. Leeds policy is here. 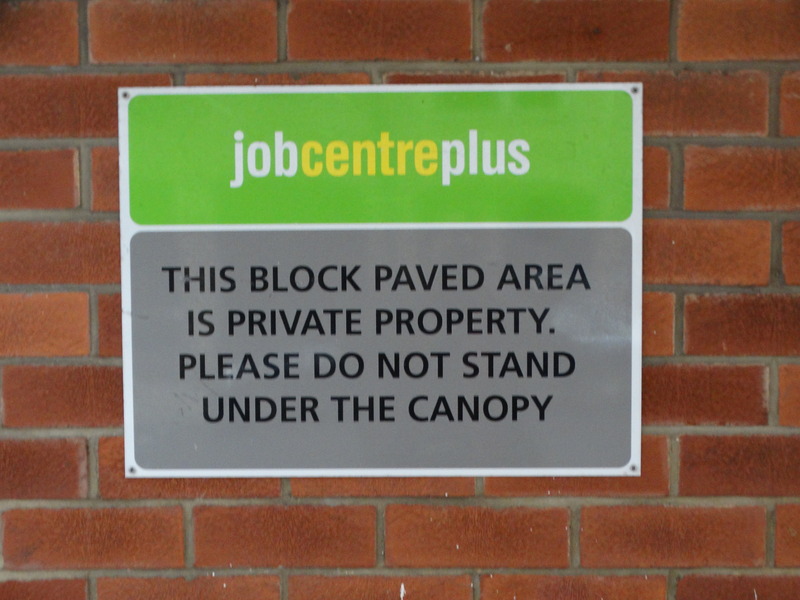 This is one of the notices which greets you as you enter. It took me a few minutes before I decided I was OK using my camera. No one challenged me – perhaps my age, college scarf, beard and notebook made me look like a proper researcher. I did not notice anyone using their mobile or taking selfies. At one point I was about to photo a wall display and realised a child was in the way. Safeguarding stopped me photoing until he had moved. When writing this up, I was wondering whether I could put the photos on my blog. There was nothing that said I couldn’t, there was no sign restricting the use of photos on social media. I decided I should ask the museum for permission, emailed them with the first draft of this blog, and was assured I am welcome to use them. I had lovely emails from curators Lucy and Ruth discussing my thoughts, and giving me some of theirs’. I am very grateful. 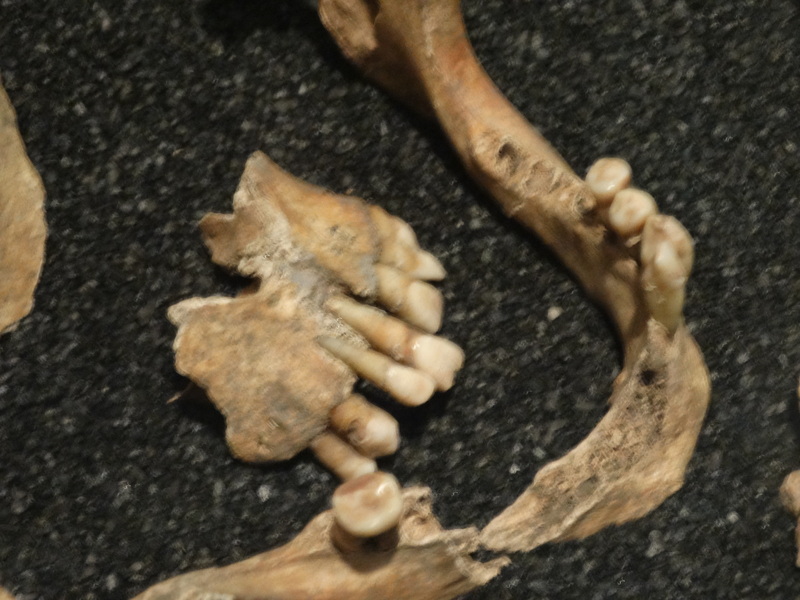 Lucy gave me this information – “Links to human remains documents are in the policies and practice part of the website and human remains is here. You might also be interested that we have an evolution position statement – here – (which came as the result of a project we did on human evolution)”. The skeletons are displayed in twelve cases, in one room, each with a label. There is other display material around the wall, with photos of the burial sites. There are no photos of the skeletons in situ on display, but they are in the leaflet. There are no reconstructions (either physical or drawing) of faces or costumes. The first two skeletons (A & B) are a Double Burial from Wattle Syke near Wetherby, Iron Age 170 BC to AD 30. A search found this website which has reports of the dig. The two skeletons were found together in a double crouched burial, a woman aged 46 or over was found positioned behind a younger male (36-45). As the leaflet says “We can only speculate what their relationship was”. This is the skull of the woman, it shows a benign, non-cancerous tumour. She had osteoarthritis, heavy dental ware and three abscesses. The male skeleton shows evidence of large muscle attachments on shoulders, arms and legs, showing he was probably carrying out manual labour. This York Archaeology website has a full list of guidance notes about human remains and churchyard archaeology – and even a diagram of how to pack a skeleton. 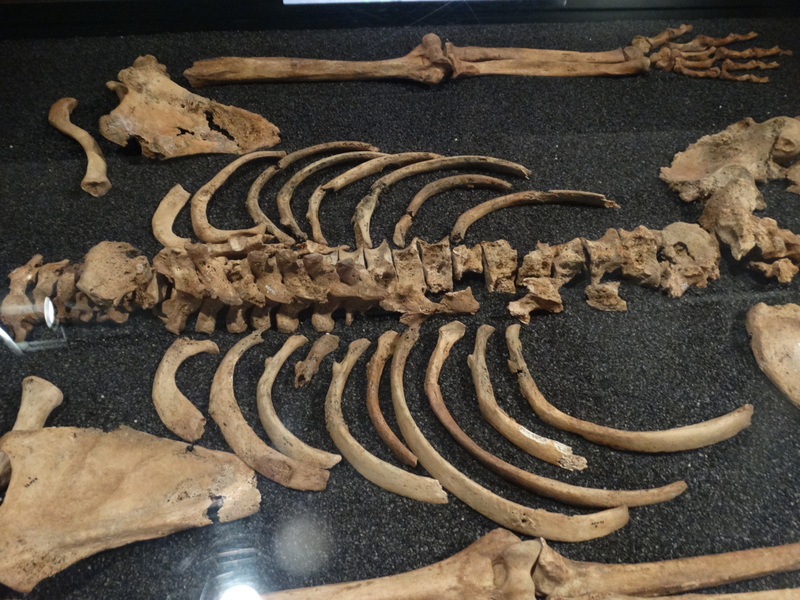 The first London skeleton is a Roman male, over 46, excavated from Spitalfields. There is a full report of the excavation here. He suffered from Osteochondritis dissecans, a painful joint disorder, which usually occurs in the 20s and is associated with excessive use of a joint, and Sinusitis and inflammation, which may indicate that he lived in a polluted environment – Roman London full of smoke. 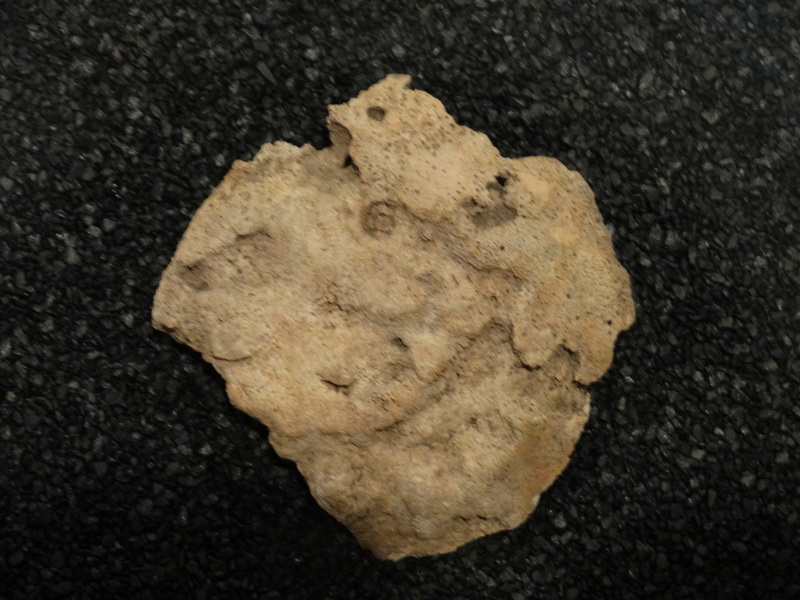 The Roman from Yorkshire is a male from Dalton Parlours, near Collingham – website. According to the leaflet, he was buried face-down, which is unusual, and he was buried in a position as if he had suffered a spasm of his muscles, causing the extreme backward arching of his head, neck and spine. This could show he was suffering from a disease like tetanus. This burial position is very different to the way he has been displayed in the exhibition – and you don’t get any impression of his pain. From London we have a skeleton with a green tinge. She came from East Smithfield, and is a young woman with no visible trauma. She was found in the first dedicated Black Death cemetery in London. The outbreak started in 1348, and wiped out between a third and half of London’s population. The bodies were buried five deep, with children placed between adults to maximise the space. Although buried in mass graves, they were neatly stacked and properly arranged, laid feet facing east according to the Christian tradition. (The notice does not explain where this tradition comes from – when the Lord comes at the Second Coming he will come from the East (Matthew 24.27). Humans will rise to face him. (We priests are buried facing west. We will rise to face our people)). Later the Cistercian Abbey of St Mary Graces was built on the site. Excavation report here, and images here. The green tinge on the skull is because, after the Dissolution, it became the site of the Royal Mint, and the metal stained the skull. Death from plague leaves no signs on the bones – it is too fast to leave a mark. 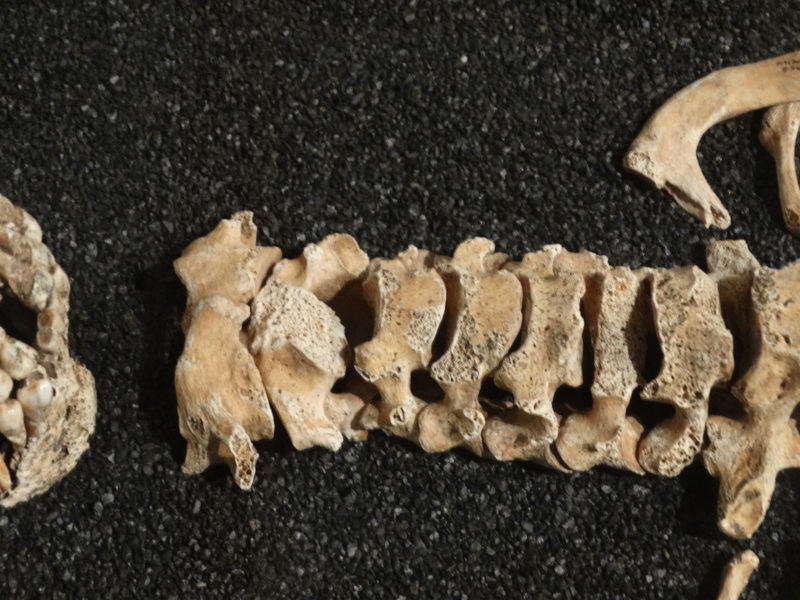 The second Smithfields burial shows a projectile injury in the spine, but the bones had healed, indicating that the individual, a man, survived the attack – it just missed his spinal cord. The projectile, an arrowhead, is not displayed. From York we have a skeleton from All Saints, Fishergate. She is a female over 46 and had tertiary venereal syphilis – you can tell this from the pitting on the skull. I am no expert on syphilis, though now I’ve looked it up on google I will get lots of emails offering me cures … but I made my own conclusion as to the sort of woman she was. Then I was surprised to see that the label said she was an Anchoress – anchoress is the female of anchorite. 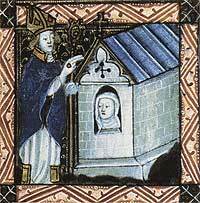 This was a woman who spent years walled up in a small cell, in prayer and contemplation, the most famous being Julian of Norwich … hardly how I pictured her. The leaflet said she was excavated from the apse of the church – for more information on the dig see this website and an article from Current Archaeology, here. Historical records say there was an anchoress called Lady Isabel German who lived in the church from 1428 to 1448. 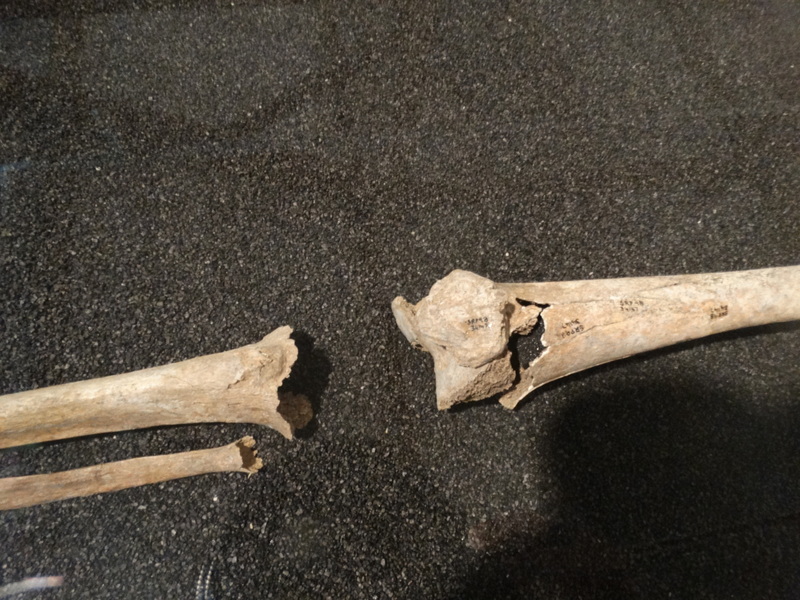 The bones also show she suffered from severe osteoporosis, not surprising if she was confined to such a small space. This was the skeleton I felt most uneasy with. Perhaps it is my own guilt about jumping to conclusions about her lifestyle. I couldn’t help thinking that if I had met her while she was alive – and I assume I would have met her as an anchoress (!) – she would have been looking at me through a small window, and I would have seen very little of her. Now I could see her whole skeleton laid out before me. How would she feel about all the visitors to this exhibition knowing about her past – and even a cleric like me concentrating more on her “interesting” past than on the twenty years she spent in prayer and meditation? I found this picture, but I don’t know where it came from. Also from All Saints, Fishergate, York, is the skeleton of a Parliamentary soldier who was buried in 1644. 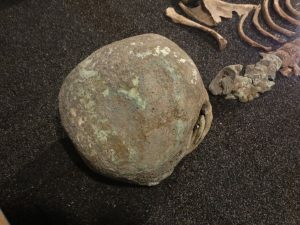 During the dig, which was in preparation for the extension of the Barbican Centre, ten mass graves were found containing over a hundred skeletons. The graves had been dug inside what was by then the shell of an abandoned church. The skeletons were arranged in rows, often with limbs overlapping, and are probably Parliamentary soldiers killed during the Civil War Siege of York – they ranged in age from teenagers to men in their 50s. Few of them show evidence of battle injuries, so it is possible that they died of disease – diseases like dysentery, typhoid and typhus would leave no marks on the skeletons. The next skeleton was from Cross Bones, London. The wall panel tells this cemetery originally served the poor of the parish of St Saviour’s in Southwark, originally established as a cemetery for “single women” (a euphemism for prostitutes), which then became a paupers’ graveyard, before being closed in 1853. For some reason the notice tells us all about the prostitutes, the Winchester Geese, but the skeleton is male. He died of Prostate cancer. If it’s left untreated it often spreads to the bone, forming painful tumours which can make the bones more prone to fracture. These, and the fractures he suffered, can be seen on his skeleton. A reminder to take prostate cancer seriously – this poor chap must have suffered. There were three students chatting away about his illness, and I asked if they were medics. No, studying archaeology at Bradford University. One of them was doing work at Bamburgh, and we chatted about the burials at St Aidan’s. At this point my mobile rang – it was on silent – and I left the exhibition to take a call from Becky, Vicar of St Nick’s Allestree. We discussed the burial of some ashes in St Edmund’s – now three quarters of us are cremated, will we have skeletons to display? – and whether the stories of those on our War Memorial have been collected. As I returned, a young lady was on duty, and we sat and had a chat. She told me she is called Afreen (I hope I have spelt that right), and is a Muslim – but she wasn’t sure what Muslim teaching was on the display of human remains. She said that she thought it was fine because of the need for education, and told me how well behaved most visitors have been. She said she loved visiting old churches – so I gave her my northernvicar card – and she wishes Muslims in Britain had old buildings. We had a chat about Lady Isabel. The final skeleton was from the Battle of Towton, 29 March 1461. 50,000 soldiers were involved, and there were more than 20,000 casualties. The retreating army was forced to scramble over piles of bodies in order to escape. If that’s not bad enough, in 2006, builders installing a new garage at Towton Hall uncovered a mass burial of 40 skeletons, tightly packed and buried in a shallow grave. “The bones showed evidence of violent injuries, particularly to the skulls. It is likely that these individuals were executed after the battle rather than be killed on the battlefield itself.” There are several websites about the battle, including bbc news, and the battlefield group. There is a Visitor Centre in the grounds of the Crooked Billet pub in Saxton near Selby – SE 475368 – a few miles south of Tadcaster, nearest station Church Fenton. Room 2 includes a Roman Cremation Urn from Adel in Leeds, dated AD 100-300. The leaflet makes the point “although we can’t analyse cremations in the same way as skeletons, they are still the remains of once-living people.” It is interesting how we deal differently with ashes – I will regularly received a box from an Undertaker and leave them in my study for a few days until I take them to church (though Julie tells me off if I do). We usually pour ashes straight into a hole in the ground, but some families insist on them being in a casket. My parents were cremated and dad just want the ashes scattered in the garden of Cambridge Crematorium – on one occasion he said “I don’t need to know where mum is buried, I know where she is”. We buried our boys, Gareth and Theo, at Holy Saviour, Milbourne – we want to know where their bodies are (even though I find it difficult to visit the graves). We didn’t even think about cremating them – and I don’t want to be cremated myself. I’m not sure why not … after all, I’ll be dead. The displays say that “The earliest acquisition of human bone is recorded in the 1833 Leeds Philosophical and Literary Society report as human skulls … from Cuzco, the ancient capital of Peru. But mummies were collected even earlier. The mummy of the Egyptian priest Nesyamun … was acquired in 1823, and other mummies came into the collection the following year. We still collect human remains today in certain circumstances usually as part of local archaeological excavations.” Elsewhere it is recorded that bomb damage in the last War destroyed all their collections of mummies, except Nesyamun. 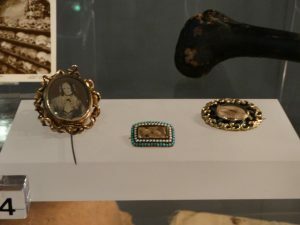 The display notes that “The human remains collection includes items which range from a complete human skeleton to a single lock of hair, as well as objects made out of human bone, hair and teeth.” Here are three brooches, each containing a lock of human hair. 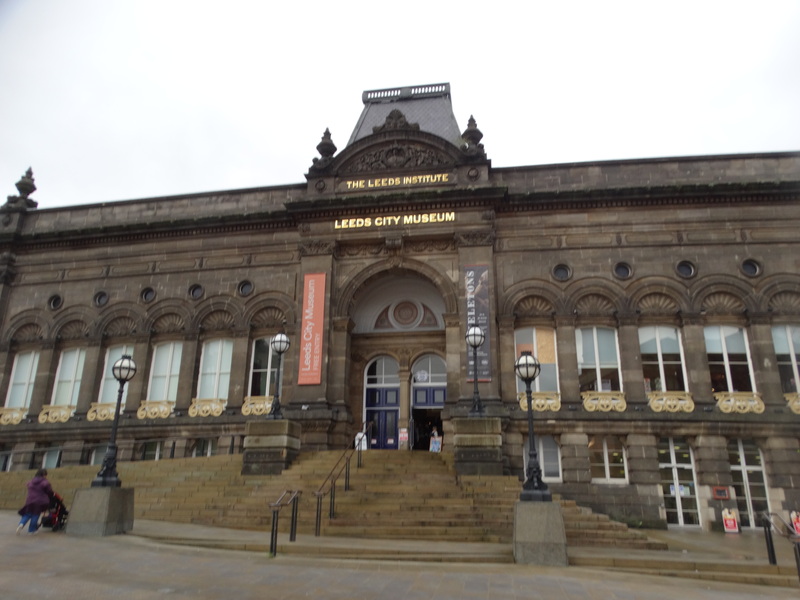 There were three videos with members of the museum staff discussing different digs in Leeds. One person talks about how the obvious violent death of one of her skeletons affected her – she uses the phrase “she has a home now”. I wondered if a cardboard storage box, presumably at the Discovery Centre, is a home. 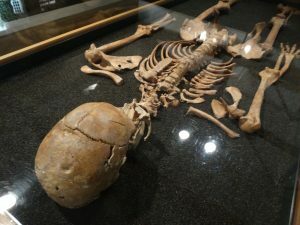 Yet there is no doubt that the remains are treated with sensitivity, that each has a unique and personal story to tell, and that we are making a connection with another human being. One of the developments is the Victoria Gate site in Leeds – which was one of the poorest parts of Leeds. Apparently some of the children’s skeletons show an overdeveloped left side, which may show they worked under the looms, collecting threads with their right hand, supporting themselves with their left. It was agreed that bodies from this site would be reburied, rather than stored. 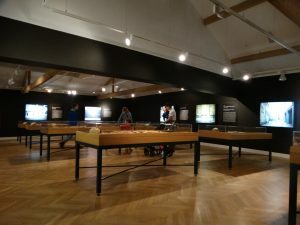 Another display says English Heritage commissioned a survey in 2009 to capture different viewpoints. 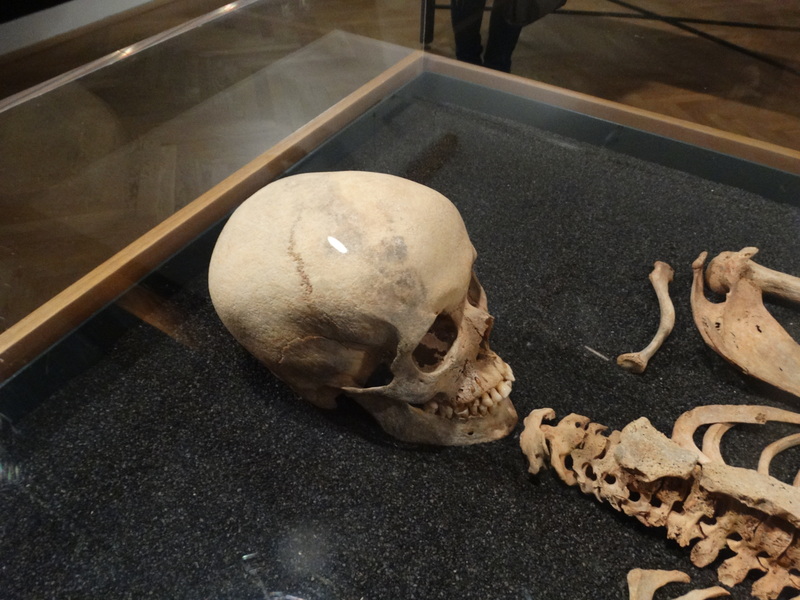 91% of respondents supported museums that wished to keep human bones for research and display. There was more concern about the age of the bones (many wanted them to be at least 100 years old) and using bones of people who could be identified by name.” The survey is here. We were invited to leave our comments or tweet @leedscitymuseum #skeletonsethics. A quick look has led me to a Conference “Skeletons, stories and social bodies” at the University of Southampton, 20-22 March 2018 – website – I wonder if anyone from the Church of England is going, or if I could find a reason (and the funding) to go. Church of England guidance is here, with a link to the Advisory Panel on the Archaeology of Burials in England – here. I did not visit the rest of the museum, but there was a huge children’s workshop happening downstairs. “A day of scientific discovery for all the family, with hands-on CSI activities.” Lots of bone-related activities which looked great fun. Well presented display – though I would have liked more information about the London burials (I’ll buy the book). Probably a wise decision not to have too many extra pictures, reconstructions, etc. – though the pictures of the sites added quite a lot. How much information do we give about each skeleton? Was I too intrusive with my camera? How do we define “respectful photography”. Do I put this on my blog? What do young children make of it? It would have been good to have chatted to a family. I still worry about Lady Isabel – is my unease because she is not anonymous? I know they are real people, but is she too real? When the exhibition is over, I assume that the skeletons will go back into storage in London, Leeds, Sheffield, or wherever. My Christian faith believes in the soul – and it is the soul that will survive death. (Ideas of a bodily resurrection were important in previous centuries, but became less important as cremation became more acceptable). I won’t need my organs, or my skeleton, once I’m dead. Christian burial is final – and any exhumation requires the agreement of the Church and Secular authorities. If I’m going to be dug up, I would like to be reburied. But I understand the archaeological interest, the use for education, and all that the skeletons can teach us. Seeing the marks on the bones brought home the pain and suffering people had before decent dentists, the pain and suffering of the Civil War, and the pain and suffering of a child working in the factories. 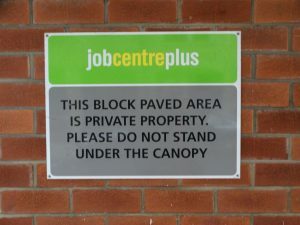 As I walked back to Leeds station I passed the Job Centre and read this sign. It seems we treat the skeletons of medieval paupers with more compassion and care than we treat those who are living in the Twenty-first century. This entry was posted in Personal, Roman, Yorkshire. Bookmark the permalink.